Everyone got fresh new haircuts to celebrate. 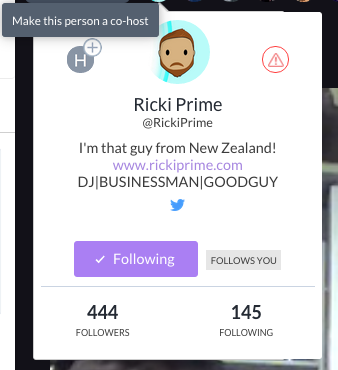 Imagine a Blab where hosts could share their power and responsibilities with another person during their Blab. Well, now that you’re done imagining it, we’re here to let you know your dreams have come true. Your prayers have been answered, because co-hosts are real. Stop dreaming about this feature existing, because it’s real. We’ve heard a request for co-hosts very early on, and are proud to announce that it’s finally here! Along with some other really awesome things… and people. OH FINALLY. It’s been the most requested feature, and an amazing one at that, so we thought we’d roll it out! The feature has been pushed for web only right now. hit the H on their profile card to add a host! The feature has been pushed for web, and hasn’t been optimized for iOS yet. 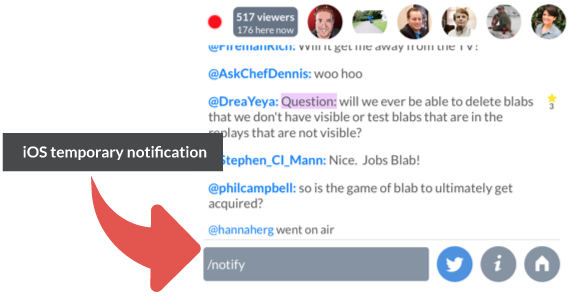 You can type in “/notify” in the chat to let your followers know you’re on air. :) This is the temporary work around until we get the iOS notification out. 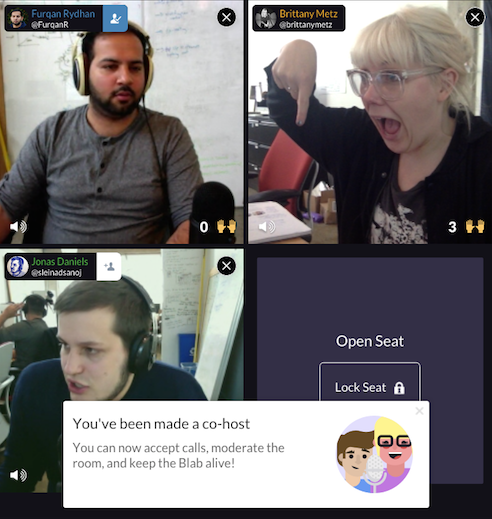 Welcome the new wonderful members ofTeam Blab: Josh, Hannah, and Spencer! Josh will be working on iOS with Neil and Derek. Spencer will be working on the web with Jonas and Viktor. Hannah will be sitting right next to me working with the community! So, expect to see her on camera a bunch! I have chosen their best photos. If I’m a co-host, will this replay show up on my profile? Yes. Are private Blabs coming? No.